1Up Box shared their October Box with us here at The Nerd Stash and after some shipping issues, we are finally able to share it with you. First of all, let me say, the fact that the post office put it in our box in the shape in which we found it is quite scary. I don’t know where the items went or who is now enjoying them but, what a mess! Now, back to the box. 1Up Box is a monthly box that contains really cool stuff for geeks and gamers. You get $40+ worth of “swag” which includes an exclusive t-shirt and 6-8 items each month. You can get your first box for $9.92 using a special code: AWESOME. Now, let’s take a look at the contents of the October Horror-themed box. 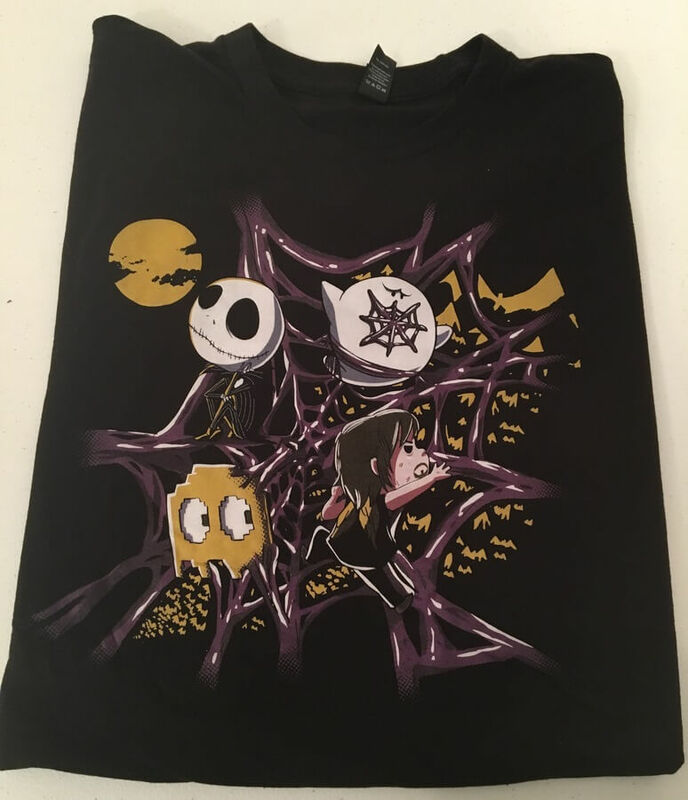 This exclusive “Get Caught” t-shirt is actually pretty cool and would have been perfect for the Halloween season. 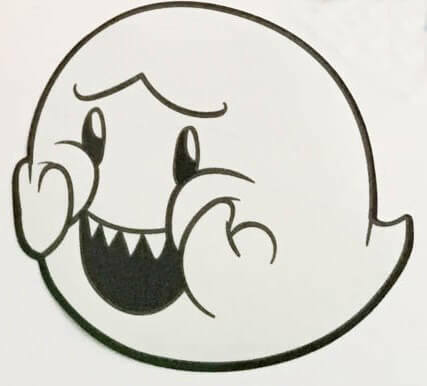 It’s a graphic of a web that has caught some of popular ghosts and skeletons from games and movies. Very Halloweeny! 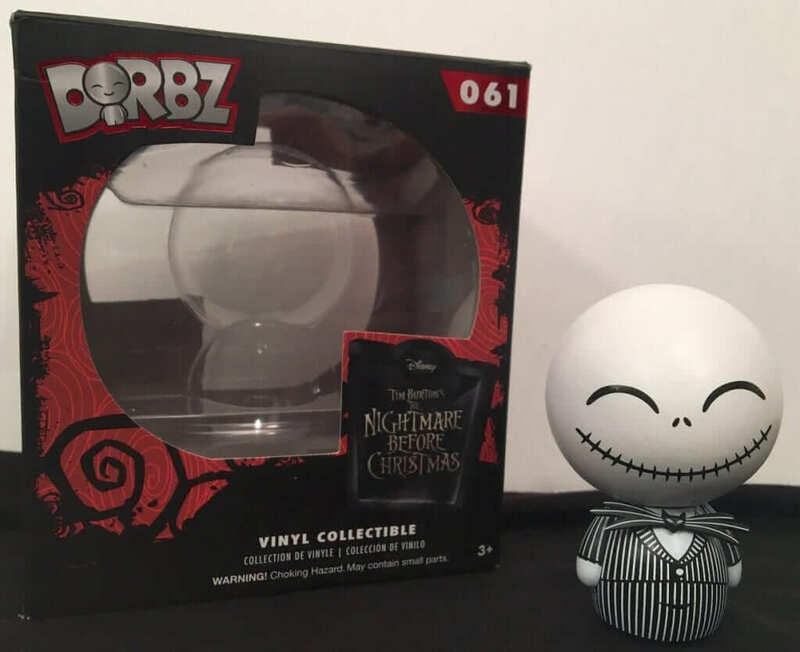 Speaking of your favorite skeleton, Take a look at this Dorbz Vinyl Collectible of Jack Skellington. Some subscribers got Oogie Boogie instead. These Dorbz are so cute! 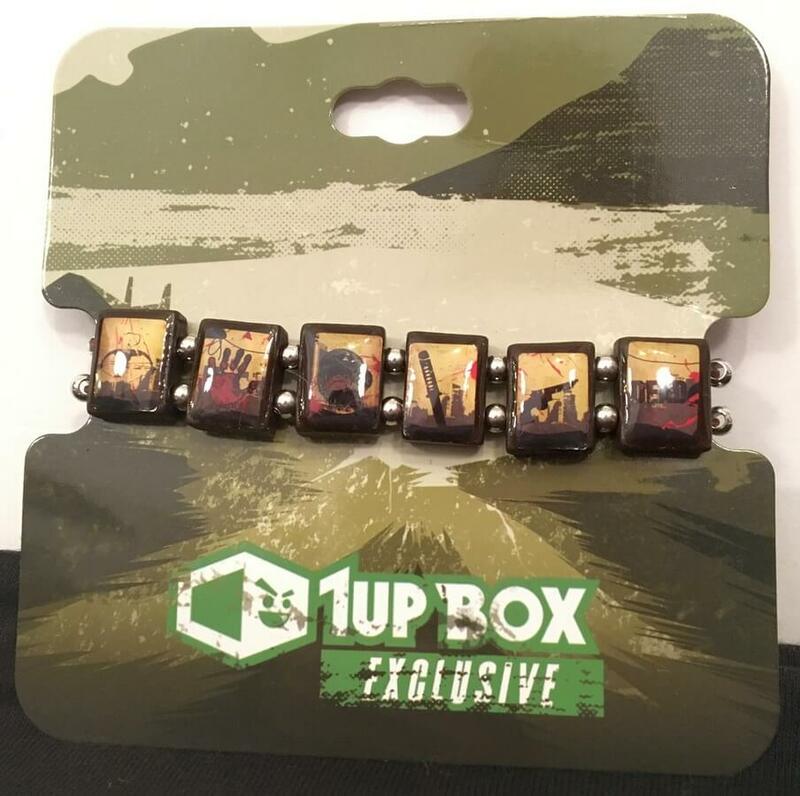 This is a 1Up Exclusive Zombie Tile Bracelet. They say it’s made of 100% anti-zombie material to help keep those zombies away. Hmmm. Definitely could be handy in the right situation! I have been fighting these ghosts for years! 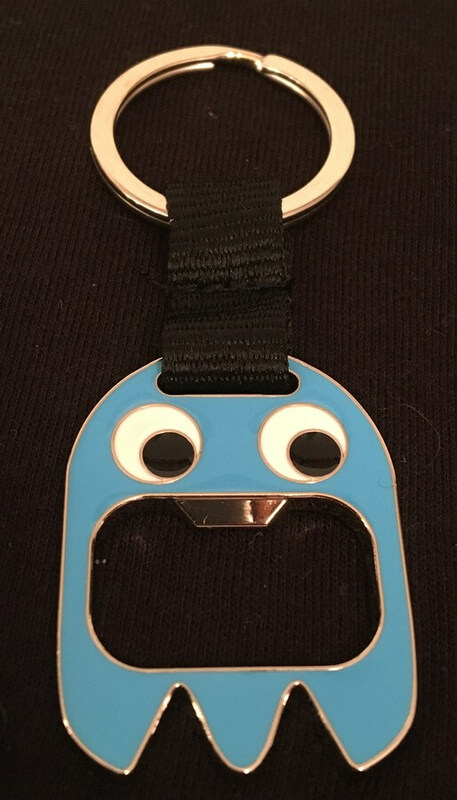 This is ghost bottle opener to keep on your key ring or in your bag or wherever it is you keep these kinds of things. I don’t need bottle openers as much as I did when I was a kid but I know there are some that still find this very handy! If nothing else, it’s definitely a conversation piece for those classic Pac-Man fans out there. My 7-year-old and I had a great time playing with this sticker! It glows in the dark! How cool is that? 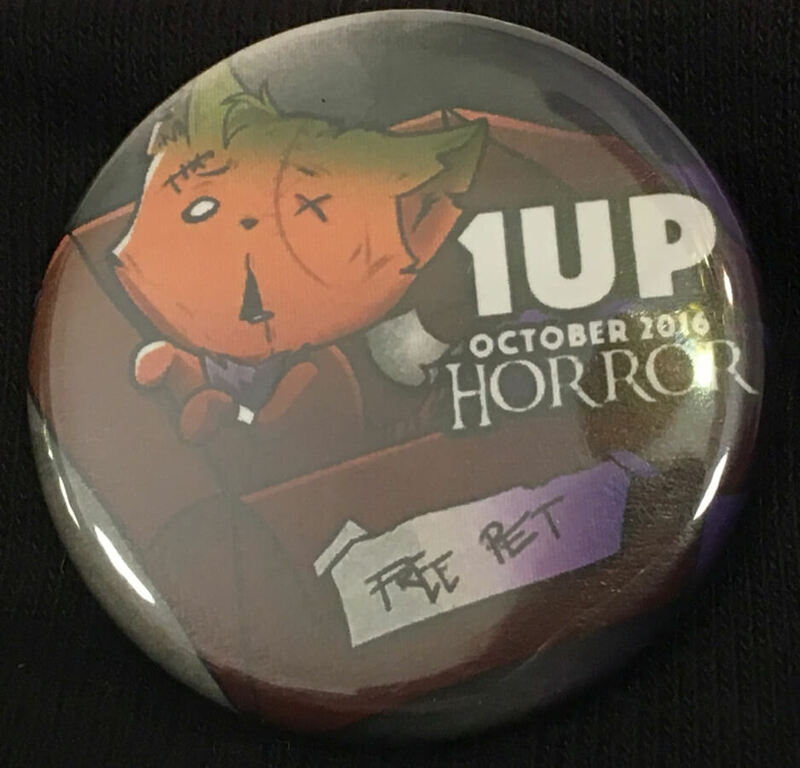 The final item is this 1UpPin showing the theme, Horror, for this month and a picture of a one-eyed cat in a box labeled, “free pet.” It’s possible I should know who this cat is but I don’t. Do you? I really enjoyed the items included in this box for October. 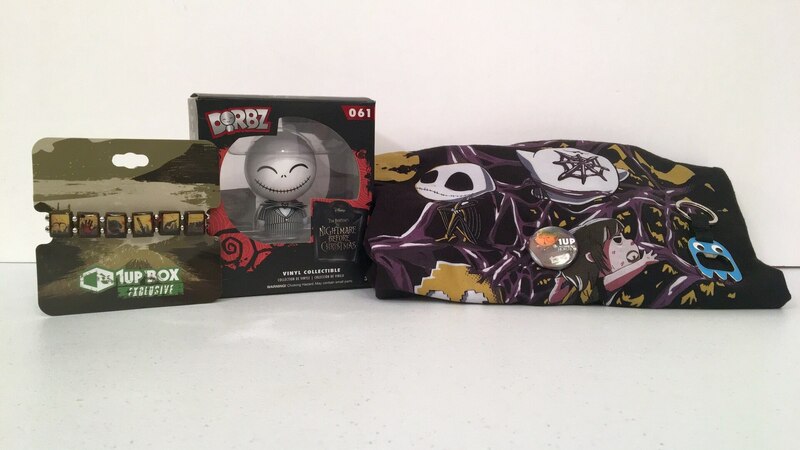 I loved the t-shirt and the Dorbz figure was great too! 1Up is a really good choice for a monthly subscription box and if you hurry, you have approximately six days to order the December “Energy” box and don’t forget to use the code: AWESOME to get it for $9.92 plus shipping and handling. After the first month, you can get it for as low as $11.92 plus s/h.